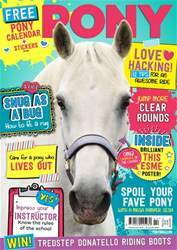 February PONY is out now and it’s full of brilliant ways you can increase your pony time, plus amazing riding and horsecare tips. Discover how to ace canter transitions every time, find out how to jump more clear rounds, and check out our 12 tips to have a super-fun hack on your fave pony. There’s handy hints for keeping older ponies happy and healthy, and learn how to care for a pony who lives out 24/7. Why not have a go at our super-fun challenge and see how many points you can score, then follow our step-by-step guide to giving your fave pony a pamper sesh? He’ll love the five-star treatment! Also, don’t miss our epic competition to win Tredstep Donatello riding boots – download your copy today!